Looking for deals in Lille? Located in the Vieux Lille district, a 5-minute walk from Lille Flandres Train Station and a 10-minute walk from Lille Europe Train Station, Hotel L'Arbre Voyageur - BW Premier Collection - LILLE... Good location, good service, very cordial people. Located in the heart of Lille, this design hotel offers en suite accommodations with free Wi-Fi and a 24-hour reception. Guests can relax on the furnished terrace with a drink from the bar. Modern & bright with large bed. Offering a terrace, Eklo Hotels Lille is set in Lille in the Nord-Pas-de-Calais Region, 1.2 mi from Zénith of Lille. There was a small problem with the room we received when we checked in. The staff were quick and efficient in dealing with it. Breakfast was offered as compensation. The alternative was even better than the booked room. Located 328 feet from Lille Flandres Train Station and less than a 10-minute walk from Lille Europe Train Station, ibis Lille Center Gares offers 24-hour reception, an elevator, terrace and free Wi-Fi... The bed, linens and pillows were awesome. The room very clean. Very good wifi signal. There is a locker to leave backpacks and pick them up later if you need. Located 0.6 mi from Lille Europe, 1.2 mi from Lille’s Grand’ Place and 853 feet from Romarin Tram Stop, Campanile Lille Euralille is a 24-hour-front-desk hotel which features a restaurant. Friendly staff, clean & comfortable rooms. Very accommodating with group bookings. Located in Lille city center, this hotel is 1148 feet from Lille’s Palais des Beaux Arts and 5.6 mi from Pierre Mauroy Stadium. The crescents were fresh and flaky...way more than just a continental breakfast. Alliance Lille - Couvent Des Minimes is a 17-century former convent located 5 minutes from the center of Lille. Nouveau siecle Convention Center is 1476 feet from Alliance Lille Couvent des Minimes. Upgrade cost was inexpensive and worth it, room was spacious and comfortable, bright and quiet. Located only 984 feet from Lille Flandres train station, this 4-star hotel is a 5-minute walk from central Lille, the Palais des Congrès and the Zénith. Location was great near the train stations and easily accessible to centre of Lille. Room was great. 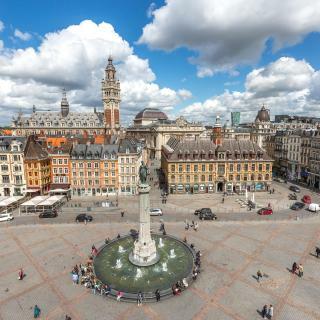 This charming hotel is located in the central pedestrianized area of Lille, only 984 feet from the Monument à la Liberté de Lille and 1804 feet from Nouveau Siècle Convention Center. Location. Room size Cost/benefits. This Novotel is in central Lille, a superb center of culture, offering the modernity of Euralille and the charm of the old city with its Flemish facades. Well executed and very nice restaurant in a wonderful neighbourhood filled with great restaurants. Located just 820 feet from Lille-Flandres Train Station, this 3-star hotel is set at the heart of the international business district. Pierre Mauroy Stadium is a 17-minute drive away. I love this hotel. Perfect location, very reasonable rates, and cheerful frontdesk reps! The Crowne Plaza Euralille is located opposite Gare de Lille-Europe, with direct links to Paris and London. The hotel is 1 mi from Lille Grand Palais and 1.1 mi from Nouveau Siecle Convention Center. Nice hotel and room with lovely bathroom. This hotel is located in the heart of Lille. It is 984 feet from Gare Lille Flandres, 2461 feet from Gare de Lille Europe and 10 minutes from Nouveau Siecle Convention Center by walk. It's a charming hotel with a perfect, central location, i.e. On the Grand Place in Old Lille, Grand Hotel Bellevue - Grand Place is set in a building of Flemish architecture and the rooms offer a marble bathroom and antique furniture. Loved the grand central nature of the hotel. It felt warm, welcoming, grand and homely all at once. Hôtel Calm Lille is set in the Lille City Center district in Lille, only a 3-minute walk from the Gare de Lille Flandres Train Station and 0.6 mi from both Nouveau Siecle and Grand Palais Convention... Easy check in. Room small but comfy. Very clean space. Near main train hub. Featuring free WiFi throughout the property, Clarance Hotel Lille offers accommodations in Lille, 1312 feet from Printemps Gallery, 1640 feet from Nouveau Siècle Convention Center and 1.1 mi from... What a beautiful and special place! Exquisite and so comfortable! The 5-star L'Hermitage Gantois, Autograph Collection offers accommodations with an on-site spa in an elegant 15th-century building. Reception staff are very friendly and helpful. Located in central Lille, Hotel Carlton is opposite the Opera, 10 minutes from Lille Europe Train Station and a 15-minute drive from the Pierre Mauroy Stadium. The facility and location were stunning. Hôtel de la Treille is located a 3-minute walk from Lille old district, 2133 feet from Nouveau Siecle Convention Center and 0.9 mi from Lille Grand Palais. Comfortable and quiet room. A bit small, but very well appointed. The ibis Styles Lille Grand Place is located in the heart of Lille, near the Grand Place and just a 10-minute walk from Lille Europe TGV and Lille Flandre Train Stations. Staff are great. Excellent value. Location honestly couldn't be any better. Mercure Lille Center Vieux Lille is located in the heart of the historic center of Lille, just a 10-minute walk from Lille-Flandres Train Station and 6.2 mi from Pierre Mauroy Stadium. The hotel is in a perfect location. The staff were very friendly. 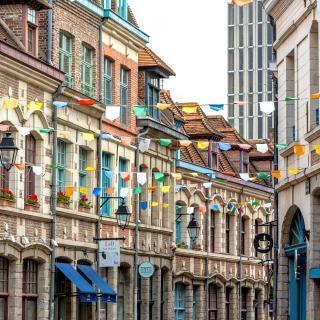 Which neighborhood is the best one to stay at in Lille? Lille Centre Ville, Gare - Euralille, and Vauban - Wazemmes are popular with other travelers visiting Lille. How much is a hotel in Lille for tonight? On average, it costs $85 per night to book a 3-star hotel in Lille for tonight. You'll pay around $139 if you choose to stay in a 4-star hotel tonight, while a 5-star hotel in Lille will cost around $210, on average (based on Booking.com prices). Which hotels in Lille are good for couples? These hotels in Lille are highly rated by couples: Hotel L'Arbre Voyageur - BW Premier Collection - LILLE, Best Western Premier Why Hotel, and Hôtel Barrière Lille. Which hotels in Lille are good for families? Many families visiting Lille loved staying at Villa Gounod, Hotel L'Arbre Voyageur - BW Premier Collection - LILLE, and La Valiz. Which hotels are the best ones to stay at in Lille? Hotel L'Arbre Voyageur - BW Premier Collection - LILLE, Best Western Premier Why Hotel, and Hôtel Barrière Lille are some of the popular hotels in Lille. Which hotels in Lille have nice views? Hotel Carlton, Clarance Hotel Lille, and Hôtel Barrière Lille got great room view-related reviews from travelers in Lille. What are the best hotels in Lille near Lesquin Airport? 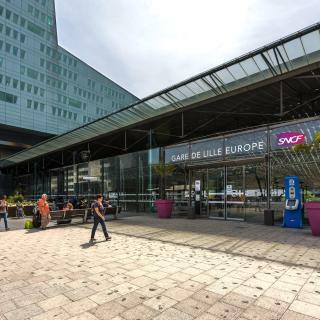 Travelers who stayed in Lille near Lesquin Airport (LIL) have said good things about ibis Styles Lille Aéroport, Mercure Lille Aéroport, and Fasthotel Lille Aéroport Lesquin. How much is a hotel in Lille for this weekend? The average price per night for a 3-star hotel in Lille this weekend is $170 or, for a 4-star hotel, $248. Looking for something even fancier? 5-star hotels in Lille for this weekend cost around $432 per night, on average (based on Booking.com prices). Which hotels in Lille offer an especially good breakfast? For hotels in Lille that serve highly-rated breakfasts, try Hotel Kanaï, Hotel L'Arbre Voyageur - BW Premier Collection - LILLE, and Hotel Carlton. What are the best hotels in Lille near Grand Place Lille? 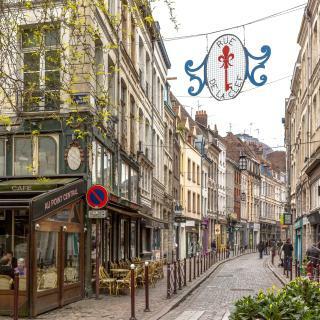 Some of the best hotels in Lille near Grand Place Lille include Hotel L'Arbre Voyageur - BW Premier Collection - LILLE, Le Laurius and Appartement Lille Gares. How much does it cost to stay in a hotel in Lille? On average, 3-star hotels in Lille cost $90 per night, and 4-star hotels in Lille are $150 per night. If you're looking for something really special, a 5-star hotel in Lille can be found for $208 per night, on average (based on Booking.com prices). 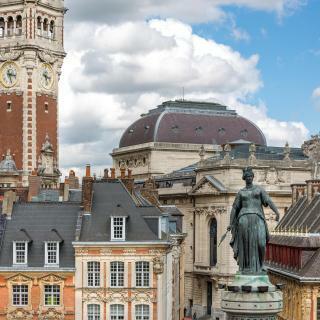 A few miles from the Belgian border, Lille displays Flemish influence in both architecture and cuisine. 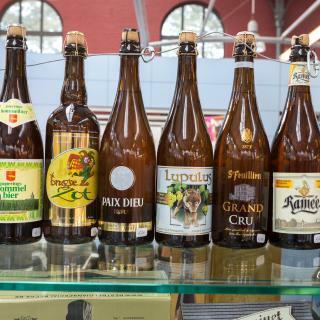 Its most famous square - Grand Place - is home to the beautiful Vielle Borse building, the Lille Christmas markets and several restaurants serving moules-frites and local beer. Behind that is the Palais Rihour, a rather odd-looking building surrounded by cafes. In the opposite direction is another square with the opera house at the center and triangular-shaped buildings fanning off in 3 directions. One of these cobbled streets leads to the Old Town, where boutiques and international brands are in beautifully crafted shops. Shopping in Lille is actually epic. It has Europe’s largest bookstore (the 8-floor Furet du Nord) and largest flea market - the Braderie de Lille. Then there is the bustling Wazemmes market and the huge Euralille shopping center. The town also has some fantastic chocolate shops. 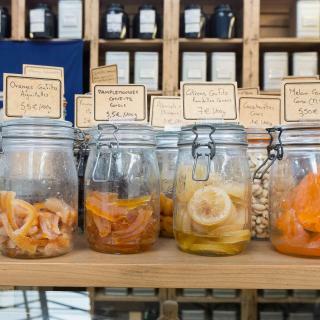 Other attractions include the Musée des Beaux-Arts and the Citadelle – a 17th-century fortress surrounded by a free zoo and gardens. Lesquin Airport is on the city’s outskirts, but most visitors arrive at Paris Charles de Gaulle Airport, named after Lille’s most famous son. If traveling to Lille by Eurostar, check out the mural of famous European landmarks before heading to your Booking.com hotel, B&B or apartment. Liked the Cathedral and small town feel. Liked the Cathedral and small town feel. The place we booked in wasn’t right for us- no elevator with 45 narrow and steep stairs. Beds were hard as concrete! I didn’t get any sleep. Was so glad to leave! A hidden gem, I would say. A hidden gem, I would say. 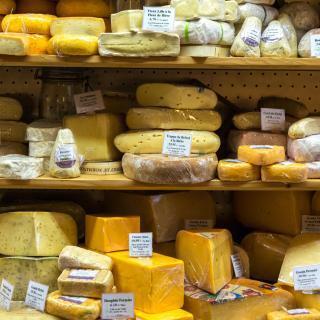 The city combines two of both worlds, the Flemish and French culture, cuisine and architecture. It had a lively atmosphere, seemed like there is a lot of things to do, plenty of bars and restaurants to discover. Definitely needs 2-3 days to fully enjoy its beauties. goede sfeer, openbaar vervoer goed en overzichtelijk geregeld , mogelijkheden voor maaltijden prima, stadswandeling leuk, mooie gebouwen, Jammer dat het fort militair terrein is en dus verboden terrein dierentuin leuk en betaalbaar! Easy to walk, no automobile needed. The people in Lille were so kind and friendly and the bike hire service is amazing. Only one issue with over zealous security guards in Carre Four scaring my son by telling him he had stolen the (out of date, bought from Wazemmes market) chocolates and that they were going to call the Police! When I asked them in future to call for the parent in the shop they stood and laughed at me. They were the exception to the rule though that's for sure. Lille is a great place to visit. Lille is a great place to visit. I thought I would enjoy it but was amazed at how much I enjoyed my stay. All parts of the City where worth visiting and the locals were very welcoming. Fab bars and restaurants and easy to walk around. We didn't use public transport at any time in the week. Take a walk down the little allyways as all the City links up well, especially when you find Old Town. All the architecture across the City is very impressive. The food was very good. Try the small bars and Tabac's they are a joy to visit, the food and wine is far better quality than you will find in many places. The clothes shops are very expensive but the vintage shops are very well priced. One tip try hard to learn a bit of French, it is always greatly appreciated. I love France and enjoyed a trip last year to Paris, I would go back to Lille before I returned to Paris as it's easier to navigate and a more gentle pace. Loved it! Amazing location right by Gare Flanders and a very short walk to city centre (5 minutes). Lille is a pretty city with lots to see so we are glad we stayed for a night. Apartment is very well equipped. Beds super comfortable even the sofa bed. It had everything we needed to make dinner at home including a few kitchen basics (spices, oil and vinegar, etc). Caroline was very kind and left us juice, milk and butter which was so nice for breakfast. It was a great apartment and very clean. I would definitely recommend this apartment!! Nicely located near the main square in the old town this hotel was relaxed and very pleasant .. actally the nicest of our European hotels. It was good value and i think i would book it again I'd we go back to Lille. Great shopping in Lille .. pity we had neither time for shopping nor room in our suitcases 😊, the former as we were too busy checking out all of the bars 😉, restaurants and coffee shops in this beautiful yet gritty town. The staff were really great and while we didnt have breakfast at the hotel it looked great. The Ibis is what it is, a budget hotel right in the centre of Lille. The rooms are basic, but very clean, and the staff are incredibly helpful and friendly. We stayed for one night at the beginning of our honeymoon as were not arriving till late and favoured location over luxury. The staff were aware and upgraded us to a larger room, we had complimentary free parking, and they made a heart out of towels on the bed - lovely touches. The location was great with many bars and nice restaurants within a 5 minute walk. It was nice stay overall. Ibis hotel chain is good as always. - Nice location. Just 2-3 minutes to Grand place and 10 minutes to Lille Europe train station - Colourful rooms and modern design. Creative wallpapers - Free bottles of water and sweets - Nice, polite and helpful staff. - Best croissants I ever tasted in hotels. Good continental breakfast. - Clean room. Comfortable bed. Funny bed lights) I would recommend this hotel to others. Great location across the street from the train station and in the heart of town so you can walk everywhere. Very clean hotel with super friendly staff. Rooms are basic and a super value with flat screen tv and private bathroom. It was also a very quiet place as I had a room facing away from the street. The elevator is a big plus too. Fabulous apartment in a great location in the Old Town. It had everything you might need as well as the added bonus of a living area, something you don't normally get in a standard hotel. Best place I've ever stayed in Lille (and I'm there alot). Would thoroughly recommend! The staff were very helpful and spoke excellent English. The room was really great, clean and well equipped. Breakfast was good, a great selection of different things to choose from. The hotel is in a great location, very quiet and peaceful although in the centre of Lille. This apartment/hotel has one good point: it is situated in the city center of Lille. With the Euralille shopping mall and Lille gare around the corner and with the historical centre just three minutes walk away that is the only positive point. Beautiful, luxurious historic hotel. Loved the original artworks. So many lovely spaces insided including an airy central atrium with a well stocked bar. Very close to the old town and station. Highly recommended. Good location, 15mins walk from the centre of Lille, free private parking. Clean and tidy hotel, most staff very helpful, the quality of a room was quite decent too, very good breakfast! Great hotel nice clean and not far from Lille old town about 12 min walk. Staff very helpful, breakfast could do with some improvement but still had everything you need it. Very good location. 1 min walking to Gare Lille Franders. Facilities inside the room are good. There are refrigerator and electric kettle. Water for shower was good. Staff was very helpful. The hotel is in a refurbished building, with lots of modern and colorful touches. The location is great! Staff were so kind and helpful. Hotel felt like you time traveled to the past. Love the windy staircase. Restaurant, bar, generally the hotel. The facility and location were stunning. I was overwhelmed when I entered the lobby and thought I could not be impressed more until I arrived in my room. I love this hotel. Perfect location, very reasonable rates, and cheerful frontdesk reps!